One of the most common phone calls we receive in regards to mold in a home is for mold in the attic or mold in the basement. Proper attic venting is crucial to prevent mold growth in the attic. Recently we were called out to a home in the Appleton area where a home inspection turned up mold in the attic. Our first priority is to always find the source…what is causing the mold to grow. In this particular home, the bathroom vents were properly vented. However, the vent had wear and tear causing cracks in the vent pipe and allowing the warm moist air to escape into the attic. That moisture is what causes the mold to grow. As we’ve talked before, mold is everywhere. It’s a matter of not allowing it to grow by controlling the environment. 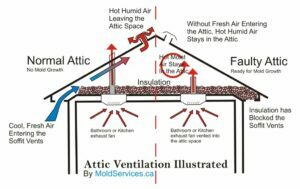 Below is a cross-section photo of a home showing attic ventilation. This is a good visual to explain what we mean when we say that the bathroom vents should go up and out the roof. Some people will use straight venting (like in the photo below) while others will use venting into the eaves of the home. 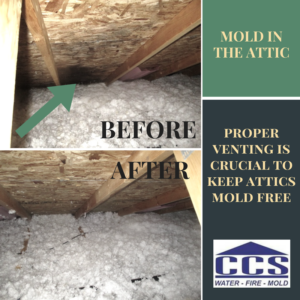 Proper attic venting will allow the moist air to escape and allow air flow into the attic. Cross-section photo courtesy of moldservices.ca posted on http://www.vendermicasa.org. It’s always a good idea to be checking your home and it’s mechanics periodically. If you rarely go into your attic, try to make it a practice to check it and make sure that no mold is growing. If you do find mold, give us a call at 920.435.2288. Keep your home healthy for your family.